Market segment (index representation) as follows: Marketwide (Russell 3000 Index), Large Cap (Russell 1000 Index), Large Cap Value (Russell 1000 Value Index), Large Cap Growth (Russell 1000 Growth Index), Small Cap (Russell 2000 Index), Small Cap Value (Russell 2000 Value Index), and Small Cap Growth (Russell 2000 Growth Index). World Market Cap represented by Russell 3000 Index, MSCI World ex USA IMI Index, and MSCI Emerging Markets IMI Index. Russell 3000 Index is used as the proxy for the US market. Frank Russell Company is the source and owner of the trademarks, service marks, and copyrights related to the Russell Indexes. MSCI data © MSCI 2018, all rights reserved. New Chairman of the Federal Reserve, Jerome Powell, took office on February 5th. The Federal Open Markets Committee (FOMC) voted to increase the Fed Funds rate to a range of 1.50% – 1.75% on March 21st. According to the FOMC’s projection materials, the majority of board members expect the Fed Funds rate to be between 2.0% – 2.25% by year-end, estimating another 2-3 rate increases this year. In a press release the Board stated, “The economic outlook has strengthened in recent months.” The Board instructed the Open Market Desk to allow $12B in Treasuries and $8B in mortgage-backed securities to roll off its balance sheet in March and to increase those numbers to $18B Treasuries and $12B in mortgage-backed securities in April. Since it began this balance sheet reduction process, the Fed has reduced its balance sheet by a mere 1.48%. This will be a long, slow process of normalizing the size of the Fed’s balance from over $4 Trillion down to $2-3 Trillion. The 2-year, 5-year, and 10-year Treasury yields all rose from their year-end values, while the spread between the 2 and 10-year continued to narrow. A jump in the 10-year yield to 2.91% in late February spooked investors who became concerned that rising inflation would cause the Fed to raise rates faster. Famed bond investor, Jeffrey Gundlach of DoubleLine Capital stated that a 3.0% yield on the 10-year Treasury is a major marker that could spell trouble for stocks. The 10-year retreated to finish the quarter at 2.74%. Although coming off extremely low levels, rising policy rates are designed to slow the flow of money, and therefore, growth in the economy. The Tax Cut and Jobs Act passed late last year may provide fiscal stimulus in the near-term, but eventually, a tighter monetary policy should temper economic activity. 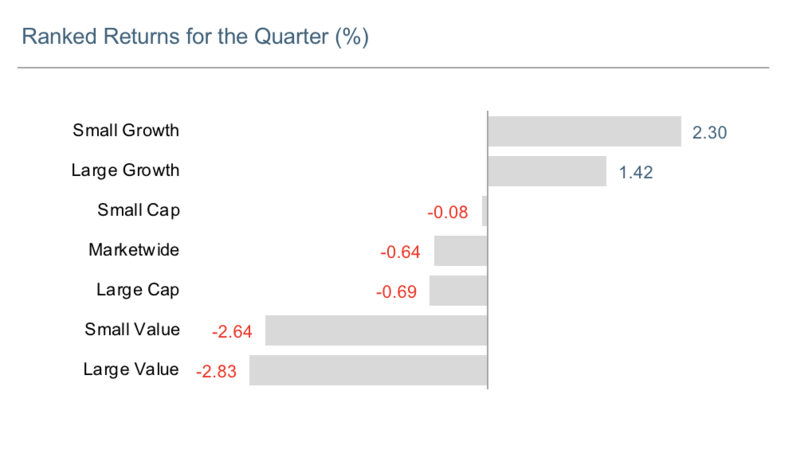 In every quarterly letter last year we wondered what happened to volatility. During the first quarter, volatility came roaring back. Many news outlets ran with the headline “Largest Drop in Dow History” when the index declined 1,175 points on February 5th. While this was the largest point decline, it was far from the largest one-day percentage decline. As the index value grows, the average daily point movement will grow as well. Investors should focus on the percentage moves, not points. Do you remember “China’s Black Monday?” All the way back in August 2015, the Shanghai main index dropped 8.49% on Monday and fell another 7% on Tuesday. On that Monday, the Dow Jones Industrial Average dropped over 1,000 points (6%) at the open. The turmoil in Chinese markets in 2015 stemmed from a drop in Chinese Gross Domestic Product (GDP) growth to 6.9%, still an amazing amount of growth for an $11 Trillion economy but below market expectations. Black Monday was the last time there was a spike in the VIX volatility index. Early February saw a similar spike in the VIX followed by a period of relatively higher volatility than the market has exhibited in recent years. 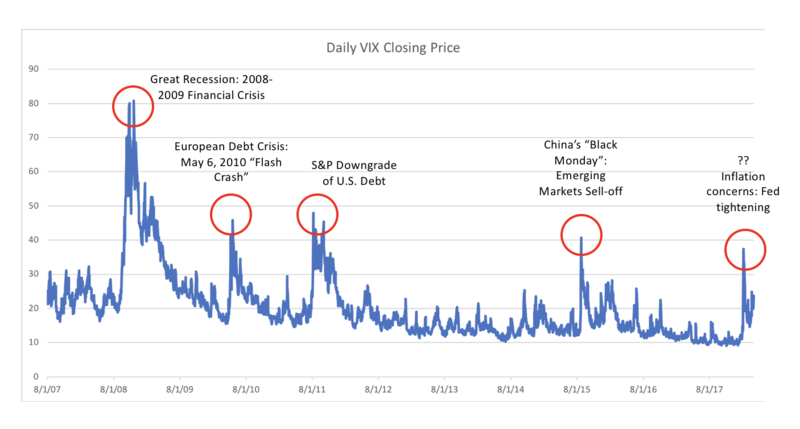 Other recent volatility spikes were a result of the downgrade U.S. Treasury debt by S&P, the European debt crisis and 2010 “flash crash” and of course, the 2008-2009 financial crisis. The craziest market event during the first quarter has been coined the “Vol-pocalypse”, and it serves as a reminder to avoid complicated financial products. Apparently, there were leveraged exchange-traded products providing inverse exposure to the VIX volatility index above. This means that when the VIX Index goes down, the product gains, or in the following story, when the VIX Index goes up, the product loses. Cleverly, one of these products issued by Credit Suisse had the trading symbol “XIV”. It’s not the Roman numeral for 14 but actually V-I-X spelled backwards. The product was designed as a daily trading vehicle to be short volatility, a bet that volatility will dampen. On Monday, February 5th, when the Dow Jones dropped over 4% and the VIX index spiked 118%, there were $1.6 Billion invested in XIV. The product lost 92% of its valued in two trading days. Credit Suisse stopped trading the fund and closed it. I’m still stretching to find a valid reason to create such a product in the first place. Add this to your list of reasons to follow the “Keep It Simple” rules when it comes to your hard earned investments. If the return of volatility has you feeling anxious, remember that is a completely normal reaction. Behavioral economic studies prove that a financial loss is twice as painful as a gain. I find that data is often helpful in combatting market fears. A market “correction” or 10% decline is quite common. 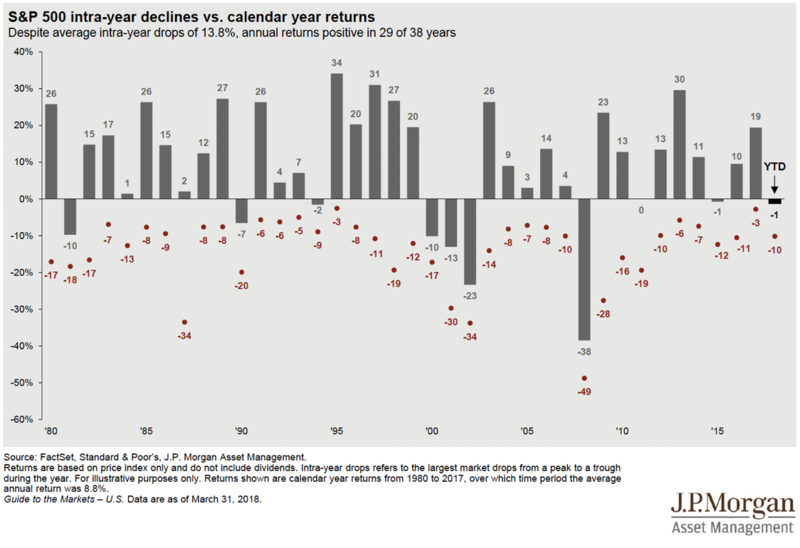 The average intra-year decline of the S&P 500 has been 13.8% since 1980. Most of those years ended with positive returns. But don’t lose sight of the fact that there will be another bear market (perhaps several) in your lifetime. No one knows in advance when the next market downturn will begin or how long it will last. People are living longer, healthier lives, which means most need stock market exposure to sustain their financial assets in retirement. The most reliable method for capturing stock market returns is to stay invested through the downturns. Timing the market successfully is nothing but luck. Practice your fortitude by visualizing what a 10%, 20%, or even a 30% drop would look like in your portfolio. The larger your portfolio, the greater the drop, just like those “points” in the Dow Jones Industrial Average. “Economic projections of the Federal Reserve Board members and Federal Reserve Bank presidents under their individual assessments of projected appropriate monetary policy”, March 2018, https://www.federalreserve.gov/monetarypolicy/files/fomcprojtabl20180321.pdf. Federal Reserve press release. March 21, 2018, https://www.federalreserve.gov/monetarypolicy/files/monetary20180321a1.pdf. Gittelsohn, John. “Gundlach says 10-year Treasury above 3% would drive down stocks”, March 13, 2018, https://www.bloomberg.com/news/articles/2018-03-13/gundlach-says-10-year-treasury-above-3-would-drive-down-stocks. Are We There Yet? What are Multiple Employer Plans (MEPs)?